Action Engineering has assembled a series of self-paced, online courses designed to advance the learning and adoption of the model-based philosophy across design and manufacturing sectors. Allow me to introduce myself: I am Duane Hess, CIO of Action Engineering. 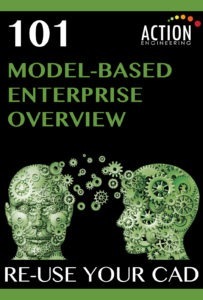 I will guide you through the learning objectives of Course 101: Model-Based Enterprise Overview. This course provides a vision of Model-Based Enterprise (MBE) that originates the Digital Thread and enables Smart Manufacturing using Model-Based Definition (MBD). This self-paced, online video course will help ground your understanding of model-based engineering and business processes. What is MBE? We define MBE in the Digital Thread, including how MBE interlinks with model data across business functions to benefit organizations. What is MBD? The basic components of an MBD data set are covered while examining some MBD use cases. We outline opportunities for measuring MBD’s return on investment (ROI). Terms and Definitions. The data comprising MBD, what a technical data package (TDP) is, and how it relates to the Digital Thread are discussed. Various MBD data set types are discussed, including which types Action Engineering endorses for maximizing ROI. Model-Based Philosophy. Including the fundamental philosophy of MBE, and the comparison of the anatomy and purpose of 2D drawings and MBD data sets. You will learn about technical data packages (TDP) and how they can benefit an entire enterprise, not just a single functional area. Standards. Various American and International standards relevant to MBE are discussed. Benefits. The engineering and business benefits of MBD and MBE. Current State of MBE. We cover the current basic state of MBE, how MBE is an enterprise-wide initiative, and how the business value of MBE increases as MBE processes mature. Q: I am pretty sure I know what MBD and MBE are; do I really need to take Course 101? A: It’s one thing to understand the concepts of Model-Based Definition and Model-Based Enterprise, but the fundamentals go much deeper than that. The implications of a 3D model as the single source of truth for downstream data consumption are hugely significant for suppliers, manufacturers, and quality folks. You want to be certain that you are handing the consumers of your data a quality “product” – comprehensive model data. This course sets the stage for students to truly understand MBD and MBE. Q: Is it possible for one person on our team to take the course and then train everyone else on our team (like a train-the-trainer course)? A: While this is possible, it’s a little like derivative data within a Digital Enterprise. It’s better to get the information directly from the source to ensure that nothing gets lost in translation. Q: Can you estimate how much my department/team will save if we implement MBD across our organization? A: When a Model-Based Enterprise is effectively set up to flow Model-Based Definition data, we have found that 20 to 40% cost and schedule savings cumulatively across the enterprise can be achieved. However, addressing only engineering, or only manufacturing, will not yield these savings. The reduction in engineering documentation time/effort is small compared to the potential downstream savings that can be realized by re-using MBD CAD data to enable advanced digital manufacturing and inspection capabilities. This course will provide you with the knowledge and tools necessary to identify these opportunities and presents industry analysis that shows quantitative savings. Q: Who are the “ideal” students for this course? A: This course is recommended for anyone in the organization that authors, reviews, or consumes engineering data. It is especially important for decision makers to understand the breadth and depth of the technical maturity and capability that they are asking their employees to implement. A wise leader will take this course to understand that MBD touches every part of the organization. Fully enabling the Model-Based Enterprise really does require the entire enterprise. Q: What learning materials are included in this course? A: The course is delivered online via on-demand video content. Students are provided with access to the content for a set period of time, even after the initial viewing of the course. Q: Can we combine some of the courses and have you conduct a webinar with multiple members of our team present? Which courses would you recommend combining in such a program? A: We are often asked to bundle our 101, 102, and 108 courses together as a workshop. This set of courses can be delivered as a webinar or in a live classroom setting. These can also be combined with our other courses. In a nutshell, that’s what Course 101 is all about. If you have any questions, please contact us. We hope to see you as one of our online course registrants soon as you begin the journey for successfully implementing MBD and MBE.